Raw Buckwheat Honey in a 1 pound container. Raw Buckwheat honey in a 1 pound container. Buckwheat honey is pungent in flavor with molasses and malty tones and a lingering aftertaste. Buckwheat honey is also very dark in color. As a general rule, darker honeys tend to be higher in antioxidant compounds than lighter ones. Because of this characteristic, darker honeys also tend to be higher in mineral content on average, as compared to lighter honeys. Ive been told that I looked younger then what I am from working out and eating Buckwheat honey on a daily basis. Excellent source for Omega Fatty Acids, Viatim, and minerals. Good for your complexion. Great honey! Love it. Highly recommended. Well packaged and shipped & delivered quickly. as ALWAYS, EBEE HONEY n e v e r fails to send only the best honey, in a timely manner. 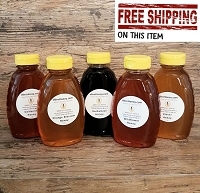 well packed, lightning fast delivery, and the tastiest honey EVER! 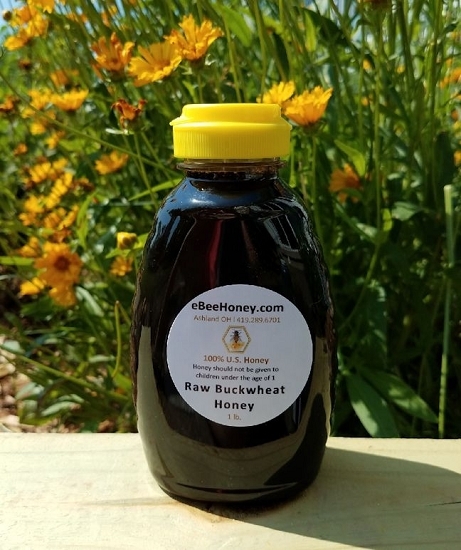 I absolutely LOVE the Buckwheat Honey RAW!. Always MUST have some on hand, and EBEE never fails to please. Customer Service is outstanding, friendly and efficient. Their product line is extensive and always exceeds expectations. Thanks again BEEz seeing you soon! I especially like this buckwheat honey on waffles and pancakes, and could easily see using it in place of molasses. It should last longer than others since a little goes a long way. One lb. of buckwheat honey arrived on the promised day, which amused me because I could have driven to the source in less than one hour. A smooth operation. I did transfer the contents from its plastic container into a glass jar since we're always being warned of the dangers of plastic packing. Sigh! Excellent product Thick, rich, molasses-like quality. I give it to my family for sore throats and coughs, but it is delicious in tea, and on toast. I always order from ebeehoney. This is a wonderful full-bodied honey. A welcome addition to the norm. I could best describe the taste as a combination of black licorice and molasses, yet still maintains it's sweetness. Spicy but not in a hot or herbal sense. I like it best with my regular teas as it tends to complicate the flavored teas, though in the right combination, with the flavored teas, it is unrivaled. This is a wonderful honey.